The name of this piece is derived from the first Image of the triptych progression as you can see the shape of a human figurine complete with wings and face. 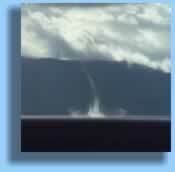 This is located inside the vortex of the giant waterspout. 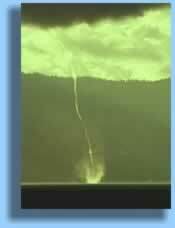 This cloud formation preceded one of the largest waterspouts ever documented. 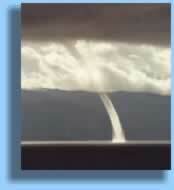 This photo represents the final collapse of the giant waterspout as it returns to Lake Tahoe. The base is estimated 175 feet across. 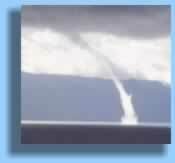 Note the large bubble of water traveling up the waterspout, appearing as if it were being swallowed by the twister. The approximate size of the bubble, is that of a small boat . This photo appears to be the longest of the series. 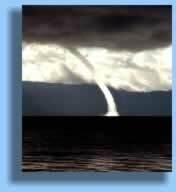 The giant waterspout is breaking up and collapsing into the lake. 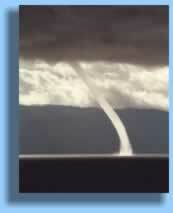 This magnificent photo, has allowed us to see inside the vortex of the twister. The base of the spout is about 250 to 275 feet in diameter. The perfect lighting conditions, clarity of Lake Tahoe, and weather conditions were in synchronization at this precious moment in time. 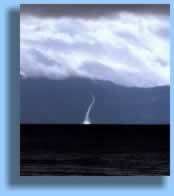 The sun was directly behind the waterspout allowing the lighting conditions for a perfect day of photography. The majestic appearance of this formation gives up the appearance of a lightning strike to the Lake of the Sky. Lake Tahoe was mysteriously calm, although the sky was stormy. 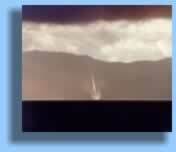 This was captured at high noon on the same day, this formation represented the end of the mysterious event on Lake Tahoe. Approximately 50 feet across and enough force to turn a boat in its wake. Rainbow birthing the Water Spout. Hay Day Book publishing 2010 ~~ at a book store near you.